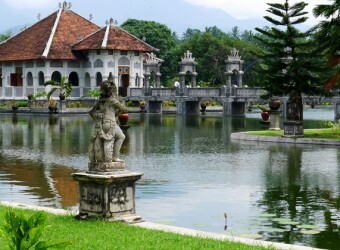 Taman Ujung locates in the quiet village, 5km south from Karangasem. The name of the village is Tumpu, and there is remain of Water Palace. The palace was built in 1920 as the resting place and guest house. Mount Agung erupted in 1960 and 1979, so it has damaged by the eruptions, however, it still remains the figure of old time. When I visited this place, there was no one and quiet. I could leisurely sightseeing. After that Balinese couple came and lying. It may also be a date spot for local people.